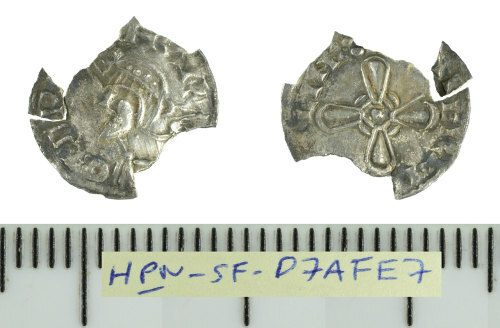 A cut silver halfpenny of Harold I, Jewel Cross type, c. 1036-1037 AD. As North, 1980: no. 802. A silver early Medieval (Anglo-Saxon) penny of Harold I (AD 1035-1040), dating to AD 1036-1037. Wulfwine moneyer. Mint of Huntington. North 802.